Heart shaped cinnamon rolls are one of my favorite Valentine's Day ideas, and I love that you can take that exact idea and spin it into something fun for St. Patrick's Day breakfast, Shamrock cinnamon rolls. You can go all out and make them from scratch, but using store bought dough, like the Rhodes rolls that they are made from, will make this even easier to get done on the eve of St. Patrick's Day. 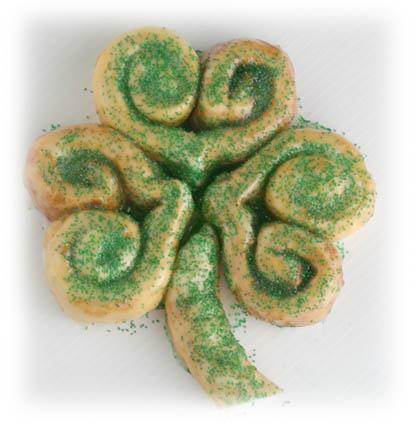 You can get this shamrock cinnamon roll recipe over at Rhodes Bread or you can check out a how to make shamrocks from store bought cinnamon rolls over at Blue Skies Ahead. Yummy! I Pinned this earlier, it's definitely on my to-do list.